Controller arms are often essential for wheelchair users who have limited mobility in the upper body and arms. Drive Medical manufactures the Swingaway Controller Arm for power wheelchairs to allow a joystick controller to be right next to the hand for control. 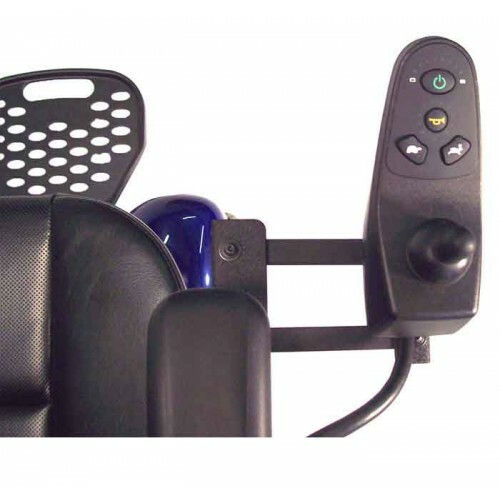 The controller can be affixed to either arm of a variety of different Drive Power Wheelchairs. This is especially helpful for those with limited dexterity in one hand. The controller has easy-to-understand controls. It comes with a toggle direction control, and three buttons. The buttons select fast, slow, a warning horn, and an on/off switch. The controller is designed to swing out of the way, making transfers into and out of the chair much easier. The joystick controller can be moved to the side of the armrest, where it is most comfortable and convenient for driving. The controller can be moved out of the way if necessary. The controls are simple and easy to understand. It is ideal for those with limited upper body and arm mobility. The device works for several Drive Medical power wheelchair models. Manufacturer Numbers: AA1800 (Wildcat 450), AA4100 (Cobalt, Titan, Medalist, Renegade, Medalist 450), SF1009 (Image and Sunfire), TRID-2A37 (Trident).